Berlin, Staatliche Museen Preuszischer Kulturbesitz, no. 245A. Poplar panel, 82.4 x 59.9 (modern addition on all four sides; original dimensions, 75.7 x 57.1; the original upper edge almost touches the hat). There are a number of small losses that have been retouched but the surface generally appears in good condition under darkened varnish. Ciardi and Mugnaini, 1991, 116, reported that the last fingers of the right hand are repainted, as is a good part of the sleeves and all the upper part of the landscape, and that in the sleeve appears its incised design underneath the surface. The sitter wears a gray-black hat over dark reddish brown hair. Reddish around the eyes, decidedly pink cheeks, and bright red-orange lips. He wears a white shirt, a dark brown mantle lined with gray-black fur; his sleeves are of gray brocade. Landscape gray and brown, the sky streaked with red near the horizon. The man with the donkey in the background wears a reddish jacket and brown trousers. PROVENANCE: Acquired in 1876 from the Marchese Patrizi Collection, Rome. 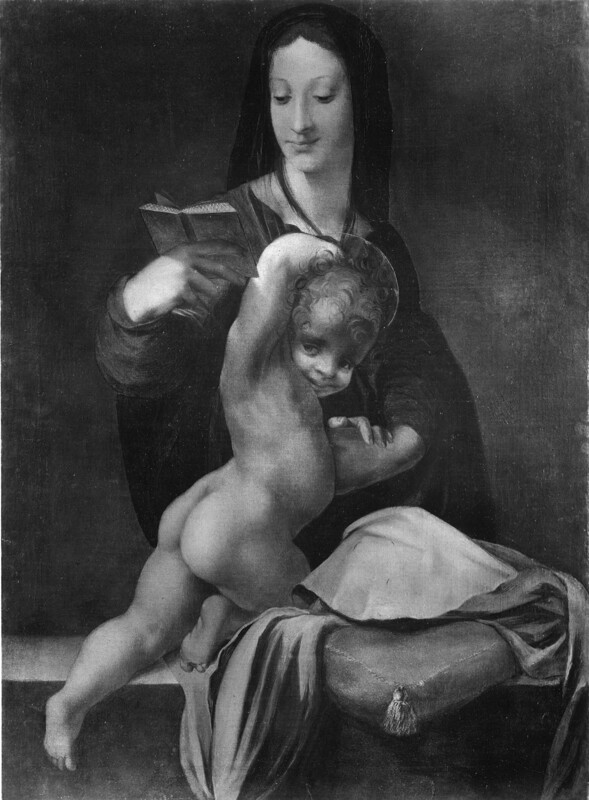 According to McKillop (see below), Berlin catalogue, 1883, as Tuscan School under the influence of Fra Bartolommeo, but also reporting Morelli’s suggestions on its attribution to Matteo Balducci, an Umbrian working under Pinturicchio, or to Franciabigio. Königliche Museen in Berlin, Beschreibendes Verzeichnis der Gemälde, Third Edition, Berlin, 1891, 99-100, as related to Franciabigio. Berlin catalogue, 1896, as Franciabigio, but with doubt. Berenson, 1896, 110, as Franciabigio. Emil Schaeffer, Das Florentiner Bildnis, Munich, 1904, 157, Fig., as Franciabigio. Phillips, 1911-1912, attributed it to Rosso, suggested that it might be a self-portrait, and dated it apparently after the Assumption. Alazard, 1924, 136-139, Fig. 37, as neither by Franciabigio nor Rosso, but with a superficial resemblance to Ridolfo Ghirlandaio’s Portrait of a Goldsmith in the Pitti; he dated it 1515-1530. Venturi, IX, 5, 1925, 442-443, as Franciabigio. Berlin cat., 1931, 173, no. 245A, the attribution to Franciabigio doubtful, but not by Rosso. Kusenberg, 1931, 129-130, as not by Rosso, but he offered no other attribution. Becherucci, 1944, 24, as Rosso, around 1515, and possibly a self-portrait. Barocchi, 1950, 88-89, 249, as Franciabigio. Longhi, 1951, 59 (1976, 99), as Rosso. Hartt, 1952, 65, as Rosso. Briganti, 1953, 51, as Rosso. Baldini, in Mostra del Pontormo, 1956, 127, as Rosso. Sanminiatelli, 1956, 241, as Rosso. Barocchi, 1958, 236, as Rosso. Molajoli, 1959, caption to Pl. VII, as Rosso. Freedberg, 1961, I, 541, 607, as Rosso, around 1516. F. S. Santoro, “Per il Franciabigio,” Paragone, 163, 1963, 14, as Rosso influenced by Franciabigio. Carroll, 1964 (1976), I, Bk. II, 108-111, P.8, II, Bk. III, Fig. 12, as Rosso, c. 1516. Shearman, 1965, II, 208, thought it may be by Alonso Berruguete, and pointed out that it is derived from Sarto’s Portrait of a Young Man at Alnwick Castle. Borea, 1965, Pl. V, as early Rosso. 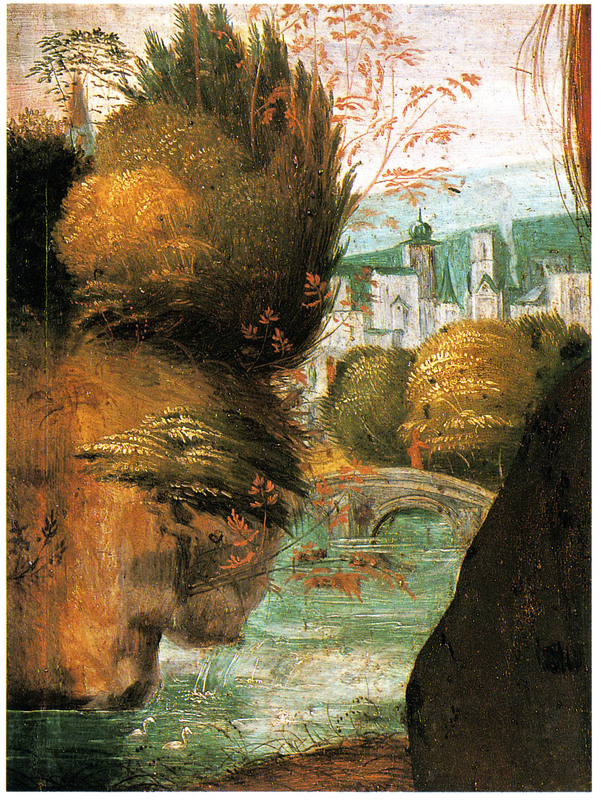 Freedberg, 1966, 583, as Rosso, c. 1517. Freedberg, 1972, 632, as uncertain of the attribution to Rosso. Erich Schleier, in Picture Gallery. Berlin, Catalogue of Paintings, 2nd revised edition, Berlin-Dahlem, 1978, 374, as Rosso, with reservation and indication of attributions to Franciabigio and Berruguete. Luciano Bellosi, Primato del Disegno, 1980, 42, as Rosso. Vasari-Darragon, 1984, 179, as Rosso. Wilmes, 1985, 146-152, Fig. 30, as Rosso and reflecting the portraits of Sarto and Raphael. The Complete Catalogue of the Gemäldegalerie, Berlin, Abrams, New York, 1986, 65, 443, Fig, as Rosso. A. Giovannetti, in Pittura, Cinquecento, 1988, II, 825, as Rosso. Costamagna and Fabre, 1991, 25, n. 4, as by Machuca. Forlani Tempesti, 1991, 276, under no. 90, as Rosso, about 1516. Ciardi and Mugnaini, 1991, 11, 13, 23, 26, 84, 100, 116-119, no. 22, with 3 Color Pls., as Rosso and perhaps painted in the Roman period. La Porta, 1992, 33, as by the young Rosso. Franklin, 1994, 212, Pl. 168, as not by Rosso, painted in the 1510s, and possibly not Florentine. Costamagna, 1994, 94-95, n. 26, stating that he and Fabre would now suggest hypothetically that it is by Alonso Berruguete. 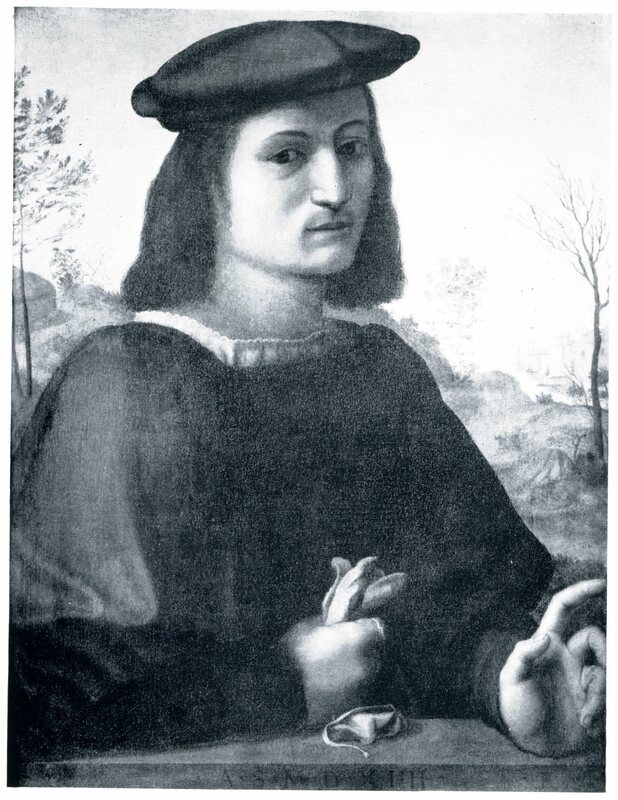 Valle, 1994, as by Rosso, done in Piombino in 1518, and a portrait of Jacopo V Appiano, painted for his bride-to-be Clarice Ridolfi and sent to her in Rome. 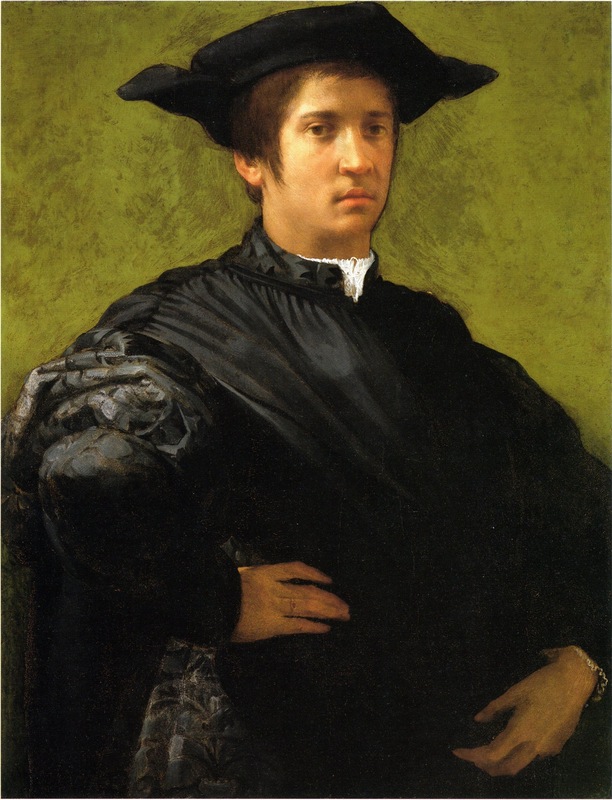 As Schleier pointed out, the strange displacement of the head to the left of the torso is not otherwise known in Rosso’s work (although whether this is not unusual in the portraits of Franciabigio and Berruguete, as he pointed out, seems also not to be the case). The disjunction between the head and shoulder is partially hidden by the large lock of hair that falls along the left side of his face. But other dislocations appear also in the relation of the hat to the head, and of the figure’s features to each other. The results suggest a lack of ability coordinating the appearance of details in space with the definition of them on the picture plane. The reading of these displacements, including the fall of the change of level of the landscape from right to left, and the psychological effect they create as the result of artistic intention would seem to be one reason why the picture has been thought to be by Rosso. But it cannot be shown that this is one of Rosso’s artistic principles at any time in his career. Nor do any early works by him show these particular kinds of disjunction as signs of youthful ineptness, not in the Assumption of 1513-1514 or the slightly later Angel Playing a Lute, or in the Portrait of a Young Woman in the Uffizi, which is quite likely by him and done around 1512. As to the picture being a self-portrait, I am inclined to believe that Rosso already had a beard at the age shown by the sitter here. 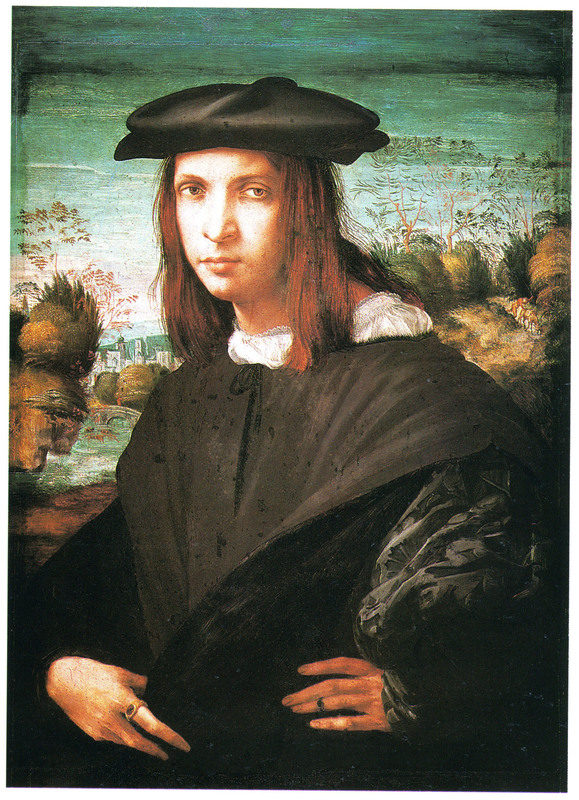 The portrait in Berlin cannot be reconciled with Rosso’s Portrait of a Young Man with a Letter of early 1519 (Fig.P.6a), nor with the Portrait of a Young Man of around 1520 in Washington (Fig.P.8a). A comparison with the first may be more to the point, not only because it is earlier and possibly closer in date to the Berlin picture, but also because it has its own awkwardnesses. There seems in it a degree of uncertainty in the size of the body and the costume in relation to the head and especially in relation to the hands, which seem too small and hence spatially unclear. But these discrepancies, which are not in any way disruptive of the continuity of the image, are not of the kind that appear in the Berlin portrait where the discrepancies are immediately noticeable. Although the drawing in the Berlin portrait is awkward in places, and may even be intentionally exaggerated to make a virtue of it, this does not overwhelm the extraordinary refinement of the picture. It is very beautifully painted throughout, especially evident in the hair, the shirt, the brocade sleeve, and the landscape. Shearman thought it was derived from Sarto’s Portrait of a Young Man of around 1511 or 1512 at Alnwick Castle. 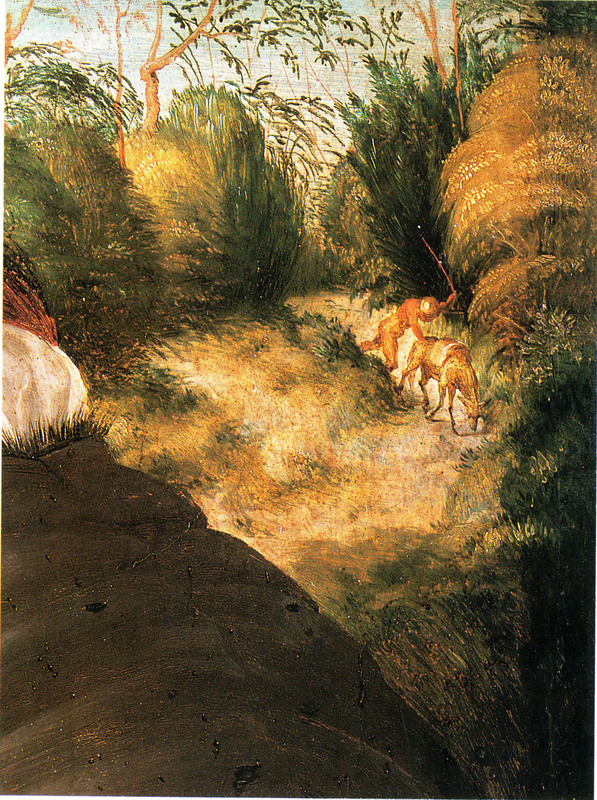 The landscapes are similar; it might also be noted that the man with a donkey in the portrait is similar to the group in the background of Sarto’s Punishment of the Gamblers of 1510 at SS. Annunziata. 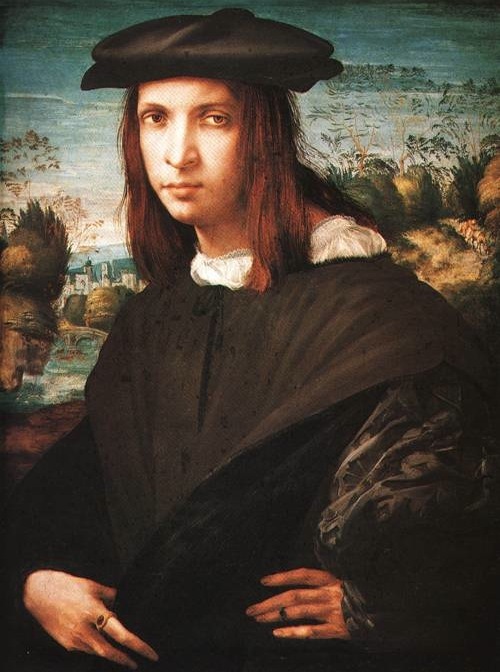 But its most immediate model could also have been a portrait by Franciabigio such as his Portrait of a Young Man dated 1514, in the Uffizi (Fig.Franciabigio),1 although the Berlin portrait has no parapet. Its earlier attribution to this artist recognized this relationship, clear as it is now that it is not by him. It is in this context that the portrait appears to have been painted. Shearman’s suggestion that the portrait is by Berruguete, attractive though it is, does not seem necessarily confirmed by comparison with the pictures attributed to him as done in Italy. Still, I do wonder if the picture is by an Italian. The strands of hair and the definition of the nose remind me of these details of the Madonna and Child that is a partial copy of a lost early painting by Rosso (Fig.P.2B) and which Longhi attributed to Machuca. The painter of the Berlin portrait would seem to have known Rosso’s works – the hair looks like that of some of the apostles in Rosso’s Assumption and the brocade of the sleeve is almost identical to that in Rosso’s portrait of early 1519 – but he knew the works of others in Florence as well. The small detail of the onion dome on the tower in the background (Fig.RP.2c) would seem to be derived from a northern source (although Valle, 1994, thought it a reference to the cathedral at Altamura that I cannot recognize). It, with a smaller onion dome, and the buildings immediately adjacent to it appear in the background of the Assumption of the Virgin with St. Thomas in Rome (Fig.RP.21b). 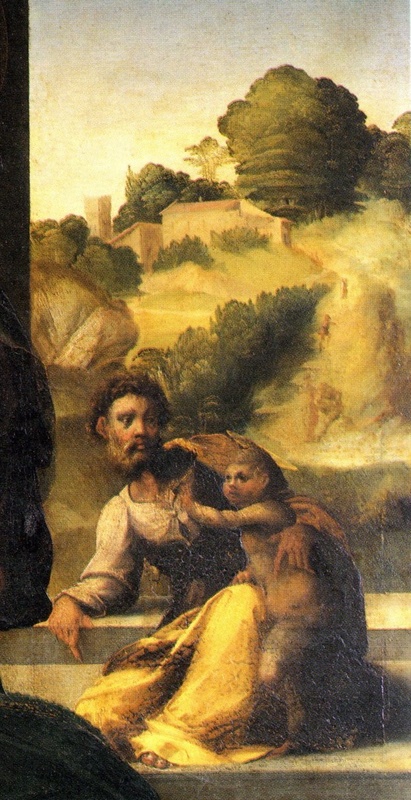 The landscape details are quite similar to those in the background of the Holy Family with the Young Saint John the Baptist in the Borghese Gallery, Rome (Fig.RP.20b). Zeri attributed these paintings to the Master of the Kress Landscapes. 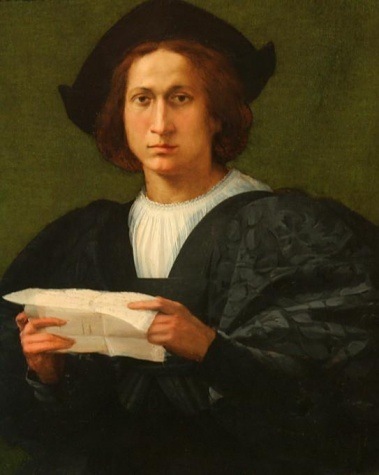 The portrait would seem to have been painted in Florence sometime between 1515 and 1520. If the portrait is not by Rosso, then Valle’s extensive argument that it is his portrait of Jacopo V Appiano need not be refuted here, especially as the evidence he offers cannot support his identification of the sitter. 1 Freedberg, 1961, II, Fig. 317.